GUYS, it's officially SPRING! I'm ready for SUN, SUN and more SUN. Aren't you?! No more SNOW. Spring excites me! All the fun new recipes, planning BBQ's and of course, enjoying good drinks with family and friends! Speaking of drinks, one of my favorite cocktails is inspired by a delicious drink I order at a restaurant all the time, the famous hurricane. The only difference, less alcohol! 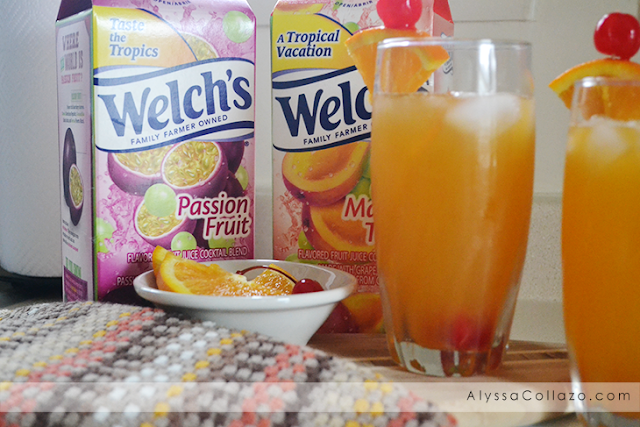 It's easy to make and you can totally turn this drink into a "mocktail"! 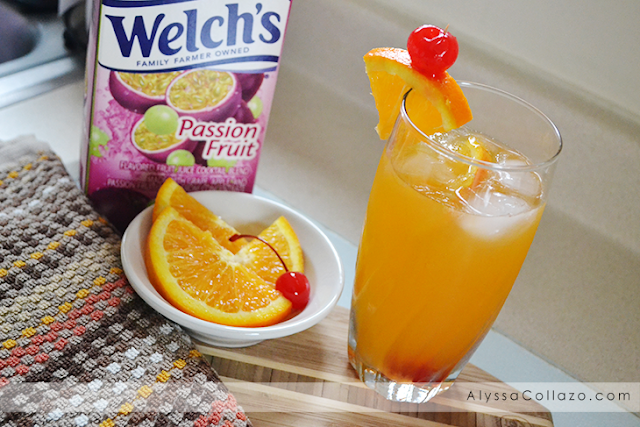 Personally, in order to have a good drink, it all starts with a good base drink and I'm loving Welch's Refrigerated Cocktail flavors. Welch's Refrigerated Cocktail flavors are seriously the perfect option! And, they have multiple varieties, like my two favorites, Passion Fruit and Dragon Fruit Mango. They taste delicious and are so refreshing! Adding a few extra ingredients makes them even BETTER! So lets jump right into my Passion Fruit Cocktail. 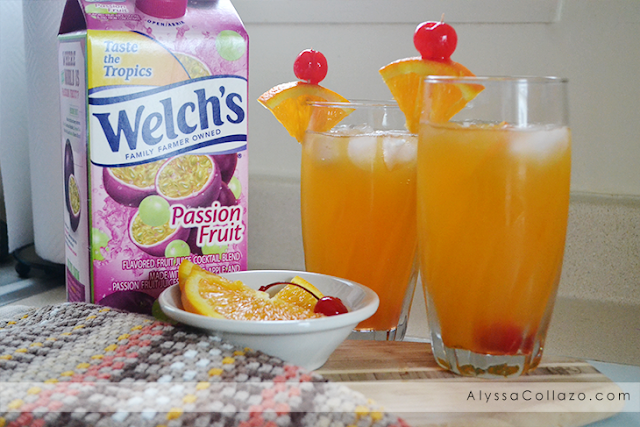 All you need is Passion Fruit Welch's Refrigerated Cocktail, Vodka, Cherries, Oranges and ice! Mix it all together and BAM, you have a tasty Passion Fruit Cocktail. I picked up Welch's Refrigerated Cocktail flavors at my local grocery store, you can find where they sell it near you, HERE. And if you aren't a big fan of Passion Fruit, for the Dragon Fruit Mango all I did was add Mango flavored vodka, mango chunks and ice! That drink was yummy too! And super easy to make. If you prefer a "mocktail" simply skip the alcohol step, add a little more fruit and enjoy. Do you make at home Cocktails? If so, what's your favorite combination? 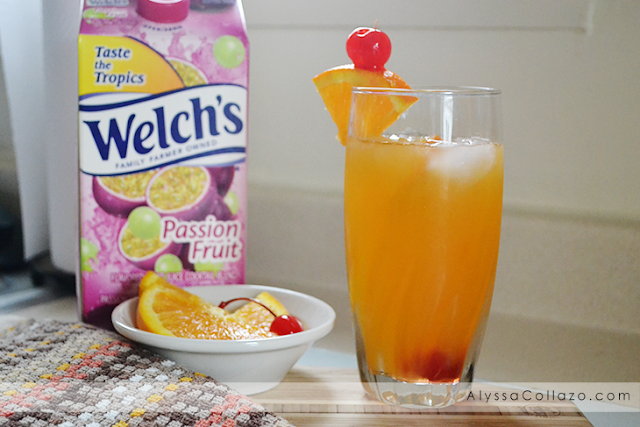 Be sure to try Welch's Refrigerated Cocktail flavors in your next Cocktail or Mocktail! I've never seen this flavor. Looks delicious. I have never tried passion fruit so I can't even picture the taste. I am going to have to get some of this juice! Yum! This looks so good. Perfect for a summer party! This looks so yummy! I have to give this a try.